Propulsion two Lawley express water tube boilers, two 2,200shp George Lawley and Sons vertical triple expansion steam engines, Farrel-Birmingham single reduction gear, two shafts. Perseverance (ex-Bedford (C.G. 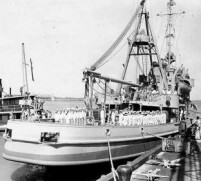 ), ex-Condor) was built by George Lawley and Sons, Neponset, Mass., in 1913 ; acquired by the Navy from the U.S. Coast Guard, 22 January 1943; converted by the Alabama Dry Dock and Shipbuilding Co., Mobile, Ala.; and commissioned 1 March 1938, Lt. Comdr. Charles E. Priolean in command. Assigned to ServRon 1, Perseverance got underway for the South Atlantic at the end of March. After working her way down the Greater and Lesser Antilles and along the coast of South America, she arrived at Belem, Brazil, 14 May, and reported for duty in the 4th Fleet. Continuing on to Recife, she served as relief flagship for V.Adm. J. H. Ingram for the remainder of the battle to block the Atlantic Narrows to enemy shipping and ensure safe passage to Allied merchantmen. With the approach of German capitulation, Perseverance was ordered inactivated. 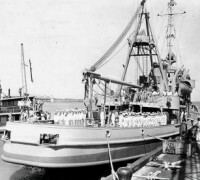 She decommissioned at Recife 18 April 1945 and was struck from the Navy List 19 May 1945. 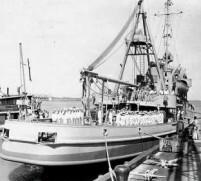 Then made available to the Maritime Commission (W.S.A.) for disposal, she was transferred a year later to the State Department and sold abroad.